Without realising it, I’ve reached another seven. Thirty-five years today. I would say it sneaks up on you, but it doesn’t really. Sure, sometimes you forget the exact number, but when you’ve had so many, they’re hard to not know they’re coming. Thirty-five. Five times over I have become someone else. That sounds about right. When I think of who I was when I was 28yrs old, they are a world away. An entire galaxy away from who I was when I was 21yrs old. And though I still cannot comprehend how many years there are between now and my 14yr old self, I find it even more difficult to see how this life came from that one. There are things that still persist. Friendships. I choose those carefully, and the fact that so many have endured is testament to how well I have chosen. And there are those, whose friendships I have not kept such a tight hold on, that remain in my heart, if not in my life. The Job. I still work for the same company if not the same role. I still sit next to Graham, well kind of. We still go to lunch on the days we’re both in together. The wanderlust. I see that my last post was in 2012 was a Bucket List. I have not crossed off a single item. If anything I could add a dozen more. But then I think, the last item…I may have found some of that. So much is different too. There is a marriage. Nieces and numerous other little people. A mortgage (I fear that will still be there in seven years). I bake. All the suggestions of a grown-up life, but still that title is not one I wear easily. In my 28th year I finally made that trip to Cambodia I had been planning since my 21st year. My final impetus? I did not want to look back two…five…seven years later and say that I should have gone then. So I went. I am still hoping for a return. That year I also started watching this webseries that would change the course of my entire life. Who I am now, who I have in my life, had I never clicked on that link, I can say with certainty that this would not be my present. I cannot say I have any idea of who I will be in another seven. I know who I want to still have in my life. I have a vague suspicion that those in my heart will still linger, as will this hunger. This need for more. To see experience more, to see more, to be more. Through the thirty-five that has always persisted. Through the seven, I hope that remains. In my mind, this poem has a line that goes, “The time has come to talk of grown up things.” It actually reads, “To talk of many things: Of shoes – and ships – and sealing wax – Of cabbages – and kings.” That sounds a lot more interesting than the things I’ve been talking about lately. On the eve of another turning of age I feel more grown up than I ever have. 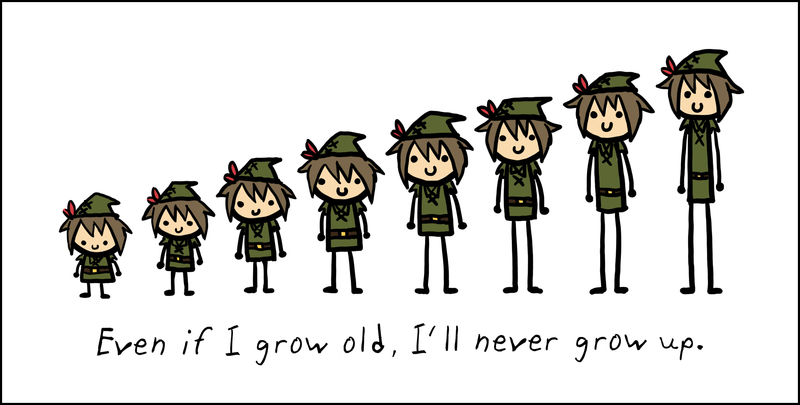 That’s not to say I necessarily feel older, although I have counted more grey hairs lately than I would have liked. Sharing the elevator with one of the more senior ladies that live on my estate who shares the same birthday with me, I was reminded that I will never be as young as I am right now, again. As much as I may bemoan the fact that I am truly a 30-something, she is a 70-something. No contest really, but I feel very much a grown up now. I have tried to deny it for some time, and I think I do a pretty good impression. I wear t-shirts with Sesame Street characters on – there will be one worn tomorrow. The concept of saving was a thing I sort of did and would do once I got the important fun stuff out of the way, like spending weeks in the jungle looking for apes. I have a grown up job but know that eventually I will get onto the real business of writing. The impression isn’t as good as it used to be. I am waiting to complete on a mortgage – my grown up investment. I am making plans to settle down – I was told by my friend that she wanted us all settled by 2013, she may get her wish. I am postponing trips, saying that I’ll make them in 20…10…okay 5yrs if I cannot hold out that long, and having to actually save for a vacation – my grown up budgeting. When did that happen? It is not where I thought my life would be, even at the start of this year. Life proves to me once again that I should not count on making too many plans. I certainly didn’t plan on being this grown up. To be honest, for the longest time I have believed my 32nd year would be my last. It isn’t a morbid death wish; I have just never been able to see me past that age. I am completely uncertain about what the year ahead has in store for me. All I have is that one constant – things will change. For the first time in so many years I feel myself having a touch of the mean reds. That feels very grown up. I will meet this next year, and whatever it brings, the only way I know how, head on, knowing that I do not face it alone. I told a friend that I realised that I need the people I have chosen around me. He beamed at my realisation; finally I am starting to get it. I wish I could say it was my resistance to accepting that he is right, but I think it is more that these are lessons we have to come to in our time. I am still learning. I had planned on being in Cuba on this day. Sat on a terrace in Havana sipping a mojito. I’m not a drinker but I figured when in Cuba, why the heck not? Instead, because of a big ash cloud that up until a few hours ago was holding everyone captive – I’m here. I’m not angry though, that’s not an emotion I’ve had much to do with this latter part of my life. Instead I think everything happens for a reason. Some have said that maybe I was going to get hit by a car in Cuba or something; perhaps so. I thought I’d need a full year to figure out the reason, but it’s taken me less than that. Perhaps it’s a sign I’m getting better at figuring out my life. Possibly. Maybe. This trip, my staycation, it is characteristic of how I would describe my life: It may not have turned out as I had planned, but it has turned out how it was supposed to. There is not a day when I do not think myself blessed for the life that I lead. Yes there are moments when I wish things were different – more money in the bank account, a Triumph in the garage, a spacious place all to myself…but like I said – everything happens for a reason. This year, I think I needed to be here today. I needed to be in the exact place where the people who mean the most to me, that I mean the most to, were within arm’s reach. I was told recently that I have no passion. Where an old me would have taken those words to heart, searched for the validity of that statement, this me knows it not to be true. My family. My friends. Those who transcend any label anyone could possibly give. They are my passion. These people are who I am my very best with. These people who do not feel I am ever too much and am always enough for. These people who say to me, ‘You could rule the world if you wanted to.’ They are my love. This year I chose thirty people, thirty of those people who have come to mean a lot to me, some over many years of having them in my life and others only recently, and I asked them to do something for me. I hope that they take my request seriously because I have never meant anything more. Because of them, because of the world they have shown me, because of the person they have helped me to become and shown me that I am, I can honestly say that today I want for nothing. There is no gift that they could give me that could mean more than what they have already shared with me. My request is the only way I know how to begin to repay them. This age, a milestone, the digits have changed and I know that there are many more changes to come, but there are some parts of me that I hope will remain the same. After all, it’s taken me a long time to become the person I am. I do not fear tomorrow and I do not regret yesterday. I wish I could tell people how I had come to look upon my life in this way, there are so many that I hope will one day realise all that they have instead of longing for what they don’t. Life has a way of placing you exactly where you need to be, and it is not always where you expected you would end up. If you’re lucky, if you are blessed, you will have people around you who will make you laugh till your sides hurt, who will support you without judgement, and who will know who you are even when you don’t. Thirty years. I must be doing something right. 29¾. That’s exactly how old I am today. Three-quarters into the final year of my 20s. One of my bestest told me she thought we were too old to fractionalise our ages. I told her I prefer it. I joked that it helps negate the years that come before. I like being twenty-nine though, I’m sure many people enjoy being twenty-nine – again and again. I like it despite what comes next. I’m quite happy to be turning the “Big 3-0”. I think partly that’s because I didn’t think I’d get there. It’s not because I harboured hopes for an early demise, far from it. I just always thought that if I did get there, I wouldn’t last for too much longer. I didn’t mind getting old, I know that it’s a privilege denied to many. I simply couldn’t see myself getting past that age. I’m still not sure that I do, but I certainly hope so. Of my years I have one regret. Ninety-nine times out of a hundred if you offered me a trip in a Deloreon I would turn you down. I cannot guarantee that my life would be as it is had I not made the choices I have, and I believe that my life is currently what it needs to be. Still there is that one moment, that one time in a hundred, where – if I could, I would like to see if it could have turned out differently. One moment I’d consider risking today for. I have been a great many things to many different people. Not all of them fun, but perhaps necessary. Today I am me again. It’s only recently that I’ve started to feel that. Yesterday I said the words that confirmed I’m back. When others know of my choice I know that they’ll question it but I could never do sustained happiness, it’s not who I am. Even when the scales are pushed in my favour, I can’t. I have learnt that I require balance. I begin to see too darkly without it. When there’s a part missing, you need to replace it. I’m better this way. The years have been unexpected, in the best possible way. I don’t think I could have predicted a single moment, I know given the choice I probably wouldn’t have chosen them. Sometimes it’s better that those decisions are out of your hands. The final stretch, almost certain to be as much of an adventure as the rest of it has been. Though I believe tomorrow is promised to no one, I still find myself smiling at the possibility. Twenty-nine years…and three quarters. Wow. I made it. I have no words of my own for them, so on this day when I celebrate everything that is them because they won’t, I shall borrow theirs and hope they don’t mind too much. I see them in everything they write, but in this I see how they see the world and I am reminded of how wondrous a place it can be if you choose to look. They capture the moments that we lose in the cracks. I am glad someone does, and I am glad that they are in my life. they looked at each other for just a moment. but sure enough to any that witnessed this moment…it lasted a lifetime. in that look they had their first kiss, their first awkward exploration, their first fight and make up. in a single moment gained from a serendipitous decision to occupy a similar space at a similar time they forged entire universes with their smiles. Today a friend of mine enters the next stage of his evolution. Another 7yrs has passed and I wonder how different he is from who he was at his last phasing. He’s a father now, albeit to an overactive Jack Russell/Border Terrier mix who destroys everything he can get his teeth into – and that appears to be most things in his once pristine home. I know that fatherhood has brought him new challenges and at times he questions his decision, but deep down I know that his “baby” is a welcome addition to his life. It’s certainly brought us laughter as he tells us of Benjamin’s latest exploits. But how else has he changed? I remember how I wrote of my Seven Year Theory at the time of my last evolution. I was so thankful for everyone I had in my life, and I really didn’t think that I could even dare to hope to know better people. Now, at the mid-way point of the second year of my evolution I couldn’t be more happy at how wrong I was. I dared my 29th year to try and even compare to my 28th (possibly my favourite of all my years), and half way through, it has answered that challenge. So far. Of course there is still time to go, but should things take a turn there is still so much I will remember this year for and feel nothing but joy in my heart. 18 months. At the start I saw how much I had changed in my 7yrs. If I keep on as I have, will I be able to recognise the next person at the start of my next evolution? I don’t know, but I do know if I do keep on as I have, that person will have the very very best of people around them and the biggest of smiles on their face. Because of who I have in my life today, I can’t wait to be the person I’m going to become.